Entance to the Tony Gould Gallery. 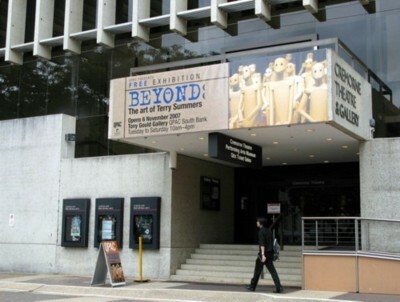 The Tony Gould Gallery is situated under the "Cremorne Theatre" on the river side of QPAC (Queensland Performing Arts Centre), Melbourne St. South Bank. The exhibition "Beyond" the Art of Terry Summers, is now open 10am to 4pm Tuesday to Saturday and continues until April 2008.